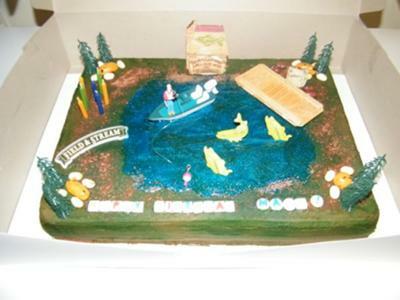 For this gone fishing cake, I used german chocolate cake and chocolate buttercream icing. I air brushed it with green and blue color. I used shaved chocolate for the dirt and candy rocks for the stones. I used blue gel for the water. I made the pier out of popsicle sticks and used a cake kit with the boat and fisherman and the fish. Return to October 2011 Cake Decorating Contest Submission Form.